Units in the Sorpsolair 72 and 73 series were developed especially to utilise regenerative energy. The innovative air conditioning concept combines sorptionbased dehumidification, adiabatic evaporative cooling and an efficient heat recovery system in a compact comfort air conditioning unit. The 72 series, without a brine accumulator, is suitable for directly utilising the waste heat e.g. from combined heat and power system (CHPS), while the brine accumulator integrated into the 73 series allows the storage of e.g. solar energy and hence increases the total efficiency of your installations. The combination of first-class components with precise control and regulation systems guarantees economical operation at all times, while ensuring the highest degree of comfort air conditioning. Sorpsolair systems are designed for all office and business buildings, as well as many other forms of application. In case of low outside temperatures the system operates completely in heat recovery mode. The standard heating coil (LPHW) compensates for ventilation and transmission heat losses of the building as required. If during summertime conditions the outside air temperature is higher than the return air temperature, the outside air will be cooled by means of adiabatic evaporative cooling. A major component of this is the double plate heat exchanger, in which the return air is “adiabatically” cooled. The outside air is cooled by the counterflowing humid, cold exhaust air, without itself being humidified. The high efficiency rate of the principle lies in the fact that both processes (adiabatic evaporative cooling of the return air + cooling of the outside air) take place simultaneously in the heat exchanger. The high degree of temperature efficiency of the double plate heat exchanger allows significant cooling of the OA-SA, by over 12 K.
If during summertime conditions the outside air temperature is lower than the return air temperature, the unit can be used for free cooling. The return air/ exhaust air volume flow and the out side air/supply air volume flow are fed through the bypass above and below the heat exchanger and the lower pressure loss reduces the power consumption of the fan units. Sorption-based air conditioning takes place in two stages: air dehumidification and air cooling. For dehumidification, warm outside air is passed through a waterabsorbing material (the sorbent, a highly concentrated salt solution). The dried outside air then flows through the double plate heat exchanger with indirect evaporative cooling and is significantly cooled in the process. The diluted brine is regenerated for reuse using heat. The heat sources that might be used are solar thermal plants, district heat networks or waste heat e.g. from combined heat and power plants or industrial processes. 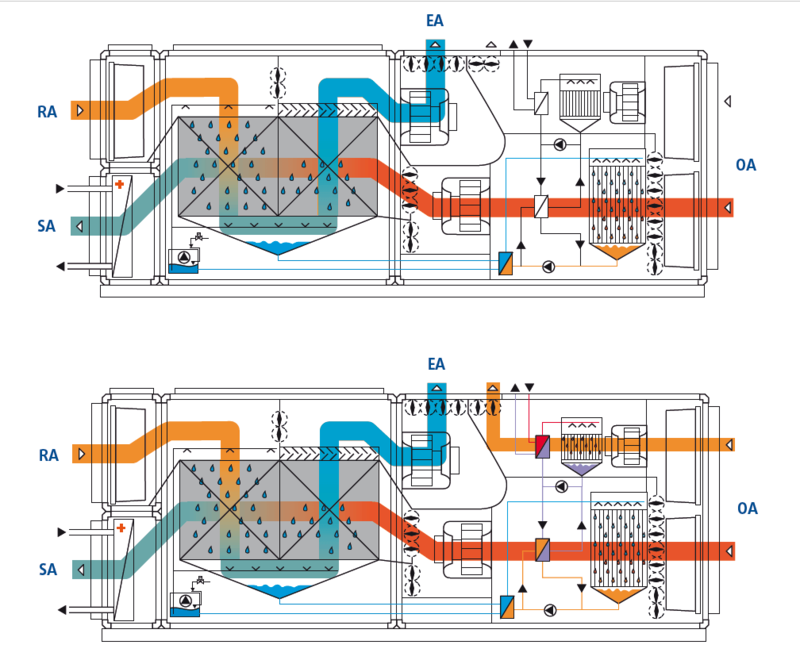 The air dehumidification and the regeneration of the brine take place in separate circuits. The heat can thus be stored almost indefinitely and without loss in a liquid form and can be used especially where there is no constant heat supply. Sorptionbased air conditioning allows cooling and dehumidification without mechanical refrigerating systems and without peak loads in electricity consumption during the summer. All recuperative heat exchangers tend to ice over in the exhaust air section in the case of low outside temperatures. In defrost operation, the OA-SA bypass opens, reducing the outside air flow rate going through the recuperator. The heat contained in the return air melts any ice in the heat exchanger, while the airflow is routed past the recuperator is precisely regulated.